This exquisite 14K White Gold engagement ring comes bead set with 36 round diamonds around the center stone and a total of 10 bead set diamonds down the sides. The matching Wedding Band has 15 Bead Set Round stones. Every diamond has a color of G-H and a clarity of SI. The matching set has a total carat weight of .76 carat. 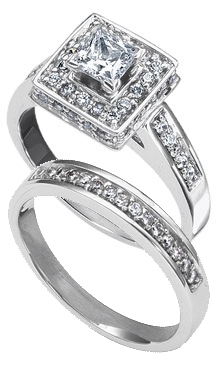 * Carat total weight has a variance of + or - 0.04 carat.